Download the Oak Terrace Golf Course mobile app to enhance your experience. Mobile apps contain many features like scorecard, GPS, tee times, news, deals and more! Click on the icons for more information and free download. 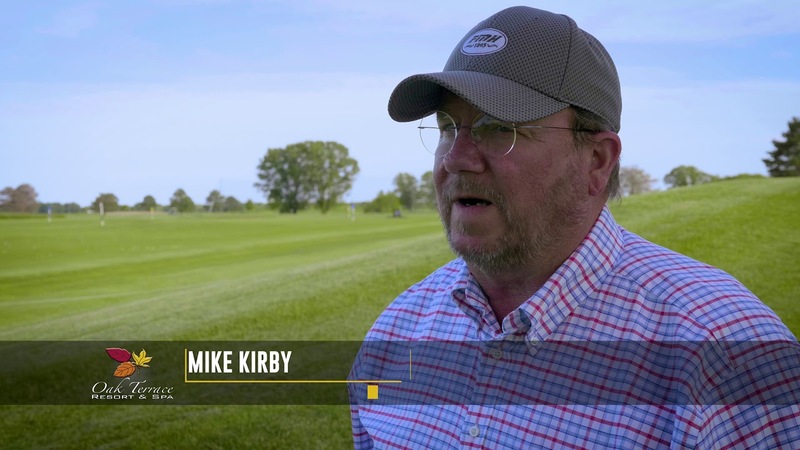 Located in Pana, Illinois (less than a two-hour drive from St. Louis and Peoria; four hours south of Chicago) you have the opportunity to experience one of downstate Illinois' finest courses. 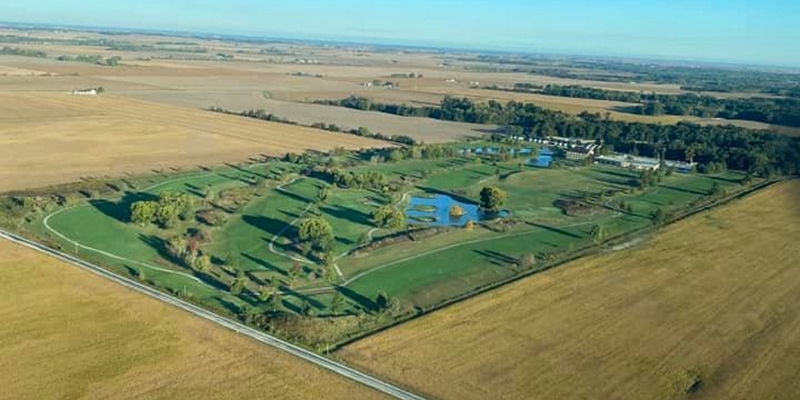 What Don and Pat Beyers began dreaming of for this tranquil spot in downstate Illinois over 40 years ago continues to develop into a resort offering the perfect getaway; a fun-yet-challenging round of golf; comfy accommodations, and a state-of-the-art spa. The hallmark of this golf course is its wooded terrain, rolling hills and prairie lands. The front nine is a links-style course featuring water hazards, while the back nine cuts through mature woodlands, challenging players with rolling fairways and water hazards. Multiple tee locations make this course enjoyable for all golfers from the champion to the novice player. Oak Terrace Resort & Spa offers premier home sites, elegantly-appointed townhomes and Lakeside Villas. 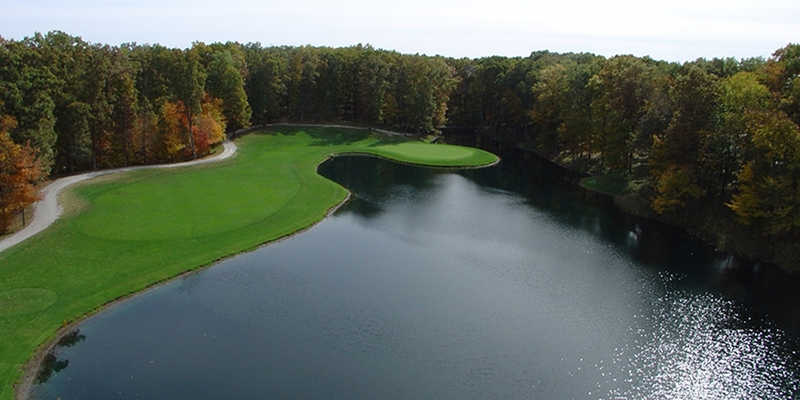 Choose from sites overlooking our 66-acre lake, championship-style golf course or a wooded lot. Oak Terrace Townhomes and Lakeside Villas are elegantly appointed and classically furnished. Call Katie Ohmes at 800-577-7598. Our Staff Will Take Care of Everything So You Can Relax and Have Fun. Whether it's a 144 player charity event or just 16 guys from the office, Oak Terrace is the ideal choice. Many corporations, associations, clubs and private groups have chosen Oak Terrace to host their events. - Assistance available in organizing putting contests, door prizes, hole-in-one events, gift certificates, hole sponsor signs and prizes. Visit http://oakterraceresort.com/events/golf-outings/ or call 800-577-7598 for more information on booking an outing at Oak Terrace! Poor planning of an event can leave a bad taste lingering with your attendees for a long, long time. Imagine this scenario: You're hosting a charitable event and everyone has a bad time ... and now you have to stick your hand out for their contribution! We've heard stories like that, and we've turned many of those horror stories into success stories here at Oak Terrace Resort & Spa. Whether you're planning a corporate meeting, retreat, extravagant wedding and/or reception or an intimate social gathering, Oak Terrace is dedicated to your needs. As experienced hosts, the staff of Oak Terrace is pleased to cater to your special event. Our elegantly-appointed banquet room features chandeliers, linen tablecloths and napkins. Our flexible space can accommodate your event, whether you're entertaining 10 or 350 guests. We look forward to the opportunity to assist you with your next event. It all begins with your call. PS: We do the work, you take the bows! Located in Central Illinois, three miles south of Route 51 in Pana, Illinois, the Inn is a haven for vacationers seeking an affordable getaway. Centered on a 66 acre lake, the Inn overlooks our championship-style golf course with each room featuring a private balcony overlooking the course. The Inn is interconnected with our banquet facility, Mulligan's Bar and Grille, and pro shop. Standard accommodations at resort. Fairway Townhomes - These two-bedroom, two-bath units - with kitchen and patio facing the course - had the golfer in mind! Lakeside Villas - This is luxury living on Beyers Lake. The villas feature two-bed, two-bath units (can be separated into a one-bed master and studio), screened-in porch with Jacuzzi overlooking the lake, fireplace, flat screen TV's with HD and kitchen area. Visit oakterraceresort.com to view pictures of our lodging accommodations. Guests also enjoy our spa sanctuary with nearby Kohler Inspired LakeView Spa & Boutique (Click On the following links to learn more about the lodging opportunities we offer at Oak Terrace and Spa. Whether you plan a corporate meeting, extravagant wedding reception, an intimate social gathering or dinner for two, Oak Terrace Resort & Spa is attuned to your needs. As experienced hosts, our staff is pleased to make your event a special event every time. Mulligan's Restaurant at Oak Terrace Resort is conveniently situated between the golf shop and banquet facility. Mulligan's features a lovely lounge (40 capacity) and main dining room (70 capacity). Feel free to choose between our "bar" menu or full dining room menu in the lounge. All of our entrees are the creations of our certified Executive Chef Connie Smith. Be sure to try our steaks, sea foods, pastas and other delightful entrees, many of which are long-standing favorites of resident diners and guests. Saturday Prime Rib Special is always a hit! Mulligan's also provides food service for your meetings, weddings, outings, events and other special occasions. This full-service bar with three TVs is the perfect place to enjoy a cold beverage and watch the leader board or other sporting events. We also have a covered patio overlooking the golf course, with seating for 72 - a great place for an informal bar-b-que or dressed up for an outdoor function! Our gorgeous LakeView Spa has been the place to go to melt away tense feelings since it opened in 2005. A relative newcomer on the scene, it's 9,000 square feet - with full-view windows overlooking Beyers lake - has become a welcome respite for many a weary golfer or resident. Open 6 Days a week. Kohler appointed fixtures and design. You don't have to watch "This Old House" every week to know the name Kohler, or know "The bold look of Kohler®." With Kohler, it's more than beauty - it's function, too! Visit otrspa.com to view a full list of prices and services. Watch the Oak Terrace Testimonials Video. This profile was last updated on 01/21/2019 and has been viewed 11,345 times.